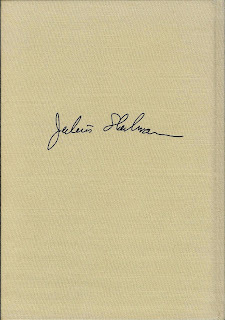 The genesis for this post came about as I was researching for a book that was intended to capture all of the covers Julius Shulman's photos have graced over his 73-year career. Shulman loved this book idea as a fresh way to capture his work which hadn't been broached to him prior to my pitch. Little did I know what I was getting into as I have found close to 800 Shulman covers to date, not to mention nearly 8,000 publications containing his work. While browsing e-Bay for material a couple years ago I ran across the above ham radio card with his signature. I had never seen anything like this before. I proudly brought my prize up to his studio to show off thinking I had made a major discovery. This happened to be just before Shulman’s 2006 “Vest Pocket Pictures” book published by Nazraeli Press was released. (see below). He then explained that it was the practice of ham radio operators to send QSL cards to each other to verify their connections. http://en.wikipedia.org/wiki/QSL. 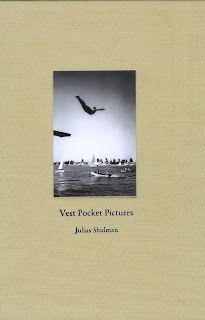 I had been to his exhibition “Julius Shulman: Vest-pocket Pictures from the 1930s” at the Craig Krull Gallery in 2004 which was the impetus for the book being published but did not remember the ham radio photo. Julius was into technology at an early age, well before his renowned passion for photography took root. 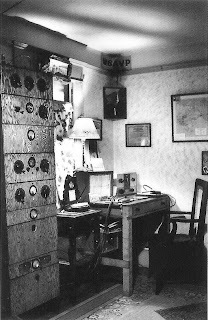 As a sixteen-year old he built his ham radio station in his bedroom in a still-existing 1905 duplex located at 546 N. Cummings St. in the Reesmont Tract in Boyle Heights. He received his ham operator's license, W6AVP, in 1926 and began broadcasting in Morse code around the world. 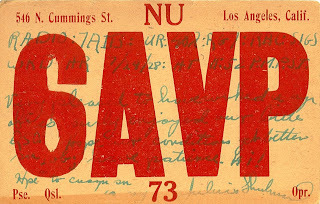 What is truly amazing to me is that if you click on the image of the QSL card and compare it to the signature on the back of his Vest Pocket Pictures book you will be able to see that his signature had not changed at all in over 80 years.